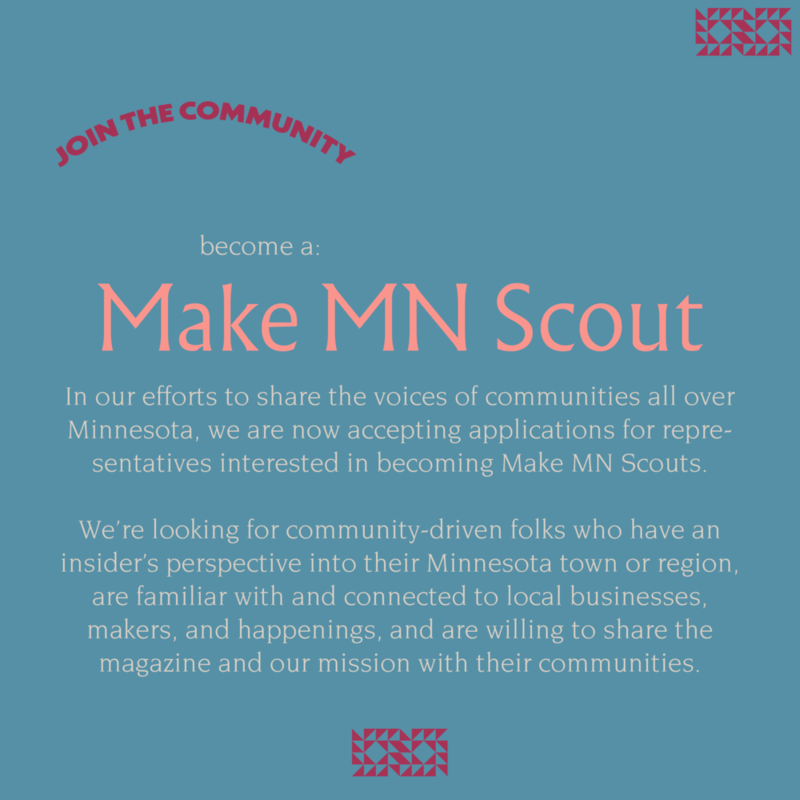 Make MN Magazine is a quarterly magazine focusing on Northern craft, community, and connecting to this place, Minnesota. We publish the voices of our communities through compelling stories, conversations, photography, essays, recipes, and illustration. Our goal in content and contributors is to represent and celebrate the intersection of craft and community in this place in an inclusive, welcoming, and creatively inspiring way. We are proud to be a woman-owned, ad-free, independent magazine - and we’re passionate about the stories of this place. Support indie publishing and the makers we feature by subscribing! We take pride in creating a quality print publication four times a year that deserves a special place on your bookshelf or coffee table. Read it in one sitting, one day at a time, or maybe save it for a snowy Minnesota day. Every bit of this magazine is made in Minnesota. We're passionate about the stories we share, the truths we uncover, the communities we reach. Our contributors are incredible and without their integrity, talent, and drive to tell honest stories, this wouldn't be a magazine at all. From issue planning to final revisions to holding print copies in hand, we love the process of building this magazine. And it's an honor to be able to share it with you. The easiest way to get hold of a copy is to order it online or visit one of our excellent stockists. Feel free to suggest a store in your town and we’ll reach out to them. Do you own a book store, local goods shop, bakery, coffee shop, or something of the like? Become an official Make MN stockist today! Email Kara to get the ball rolling! All of our subscription plans start with your choice of the current issue or next issue of Make MN, paid upfront. When do I get my supporter gift? If you have signed up for a subscription tier that includes a supporter gift, your gift is automatically sent out with the fourth issue of your subscription. How will I know when my subscription is up? We will send you a note with your final magazine as well as an e-mail before the next issue. We do hope you renew! We ship orders once weekly (usually Mondays) from Minneapolis, MN. Shipping within Minnesota is quick, usually just 2-4 days. Outside of Minnesota (but still domestic) takes around 4-7 working days. Each magazine weighs to $2.66 via UPS, and we charge $3 flat shipping + handling on any order made on our website. Even subscriptions! At the end of the checkout, you can pay via PayPal or by credit card! We're hoping to build online account access for Make MN subscribers so you're able to change your shipping and billing details on your account at any time. Until then, drop us an email about your address change! Nope, there is no digital version. We're all about the print experience. We don't have a fixed schedule, but publish a new issue roughly every three months (four magazines a year). As a subscriber you’ll automatically receive every new issue as soon as it’s released. Perhaps! Please check our contact page for more info on submissions. Can’t find an answer to your question? Contact us. Make MN is published by a small, hardworking team of passionate Minnesotans. Additionally, we collaborate with a diverse network of talented contributors on print, digital, and social content. If you’re a photographer, filmmaker, writer, illustrator, etc. and are interested in collaborating, contact us. Our first artist collaboration was with Sarah Nelson of Auslandish Company for the Curiosity Issue (summer 2018). She was kind enough to donate a big bunch of her beautifully illustrated Good Livin' Bingo Cards to make our summer issue an extra special one. Every subscriber to Make MN received one of these lovely cards. 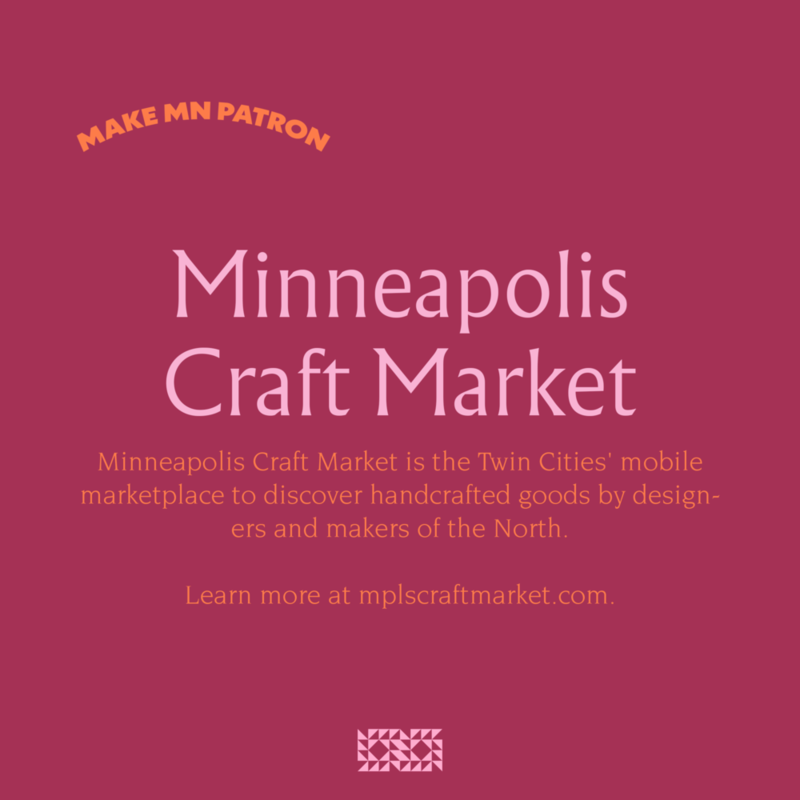 Think of a patron subscription as a way to contribute to the conversation about and celebration of the culture of making in Minnesota. Beyond sharing your business on social media, in the magazine, and on our website, we also like to get to know our patron subscribers by way of unique collaboration. We’re talking photo or essay contests, workshops, events, a magazine pop-up, an art/craft project, exclusive merchandise, and beyond! We’re looking to partner with local brands, businesses, and organizations to help us become a more sustainable, eco-conscious publication. In 2019, our goal is to improve our sustainability by printing our magazine on 100% recycled paper, and ship our magazines using 100% recycled shipping materials. Help us get there! Are you passionate about the makers, small businesses, artists, co-ops, and shops in your community? Help us scout stories, stockists, and potential collaborations in your home community! Sound like fun? Our biggest supporters, our patrons help us make this magazine happen. These fantastic Minnesota shops, small businesses, folk schools, podcasts, and design houses fund our mission to celebrate the culture of craft and community in Minnesota. Huge THANK YOU to these generous local folk!